Of the 220,000 new dwellings commenced across Australia last year the ACT's south-west area was the country's No.1 spot for growth with $216.5 million worth of new residential building approved and its population more than doubling. Housing Industry Association released its top 20 hotspots for housing across Australia on Tuesday showing Cranbourne East in Melbourne's south east as the second busiest place for new homes. 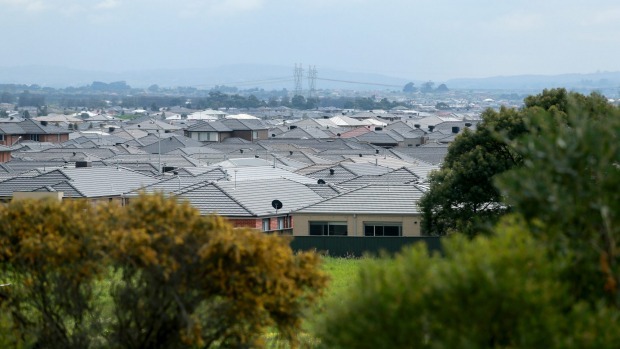 Population increased by 32 per cent in Cranbourne East with some $328.7 million worth of new residential building approved. In third place was Cobbitty-Leppington in south-west Sydney with a population increase of 26.1 per cent. "The fact that 10 of the Top 20 Hotspots are located in NSW and Victoria speaks volumes," HIA Economist Diwa Hopkins said. "These two states have been the engines of the strong upturn in new home building over the last few years." Western Australia had five areas in the top 20 including Forrestdale, Yanchep, Byford, Baldivis and Bertram. "It is also encouraging to see WA still perform strongly this time at the national level, considering the difficulties arising from the natural resources downturn," MS Hopkins said. 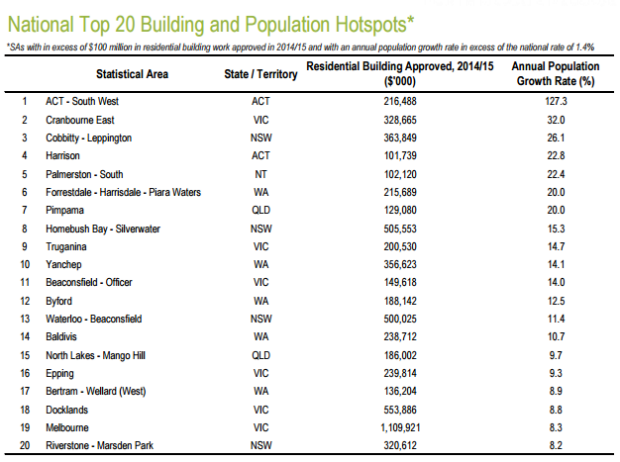 The only Queensland areas to appear in the top 20 were Pimpama at the Gold Coast and North Lakes at Mango Hill north of Brisbane. However, the growth in these areas has only just started. Last month private residential developer Villawood snapped about $35 million worth of property at Pimpama and Logan Reserve which it expects to turn into 1100 housing lots and have a joint end value of about $250 million. "Villawood Properties is optimistic about the prospects of the residential development industry in south-east Queensland and indeed, more broadly across the state," Villawood executive director Tony Johnson said. However, last year Mirvac sold its Gainsborough Greens Golf Club and an adjoining 34-hectare site in Pimpama to private operator Halcyon.